Feathers reveal more than we imagined! Who knew that this American Redstart’s feathers could reveal so much information about its life? For example, the more intense the color of a male American Redstart’s feathers, the better his chances of holding a good winter territory, which means access to good nutrition. Being well fed and in prime condition, once he gets to his breeding grounds, he’s more likely to attract more than one female, and his mates are less likely to cheat on him. Ah, the many tales one can learn from a bird’s feathers! Written by Gordon Orians, Ph.D. In addition, the more intense the color of a male American Redstart’s feathers, the better his chances of holding a good winter territory, which means access to good nutrition. Being well fed and in prime condition, once he gets to his breeding grounds, he’s more likely to attract more than one female, and his mates are less likely to cheat on him. Ah, the many tales one can learn from a bird’s feathers! 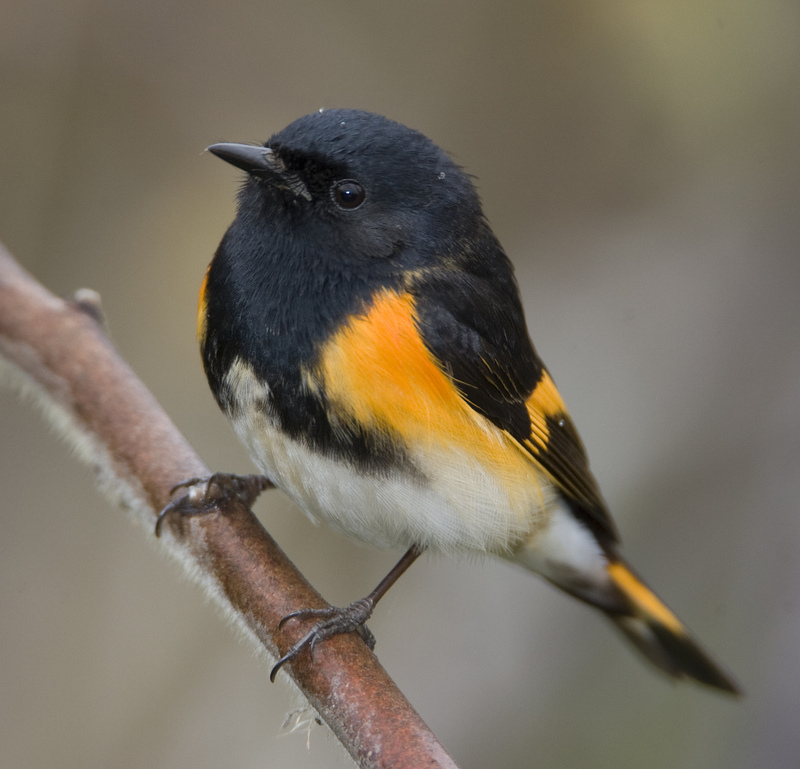 For BirdNote, [song of a male American Redstart] I’m Michael Stein. Bird sounds provided by The Macaulay Library of Natural Sounds at the Cornell Lab of Ornithology, Ithaca, New York. Song of the American Redstart  recorded by M. Medlar. Tropical forest morning Nature SFX Essentials # 36 and soft rain Nature SFX #11 recorded by Gordon Hempton of QuietPlanet.com.